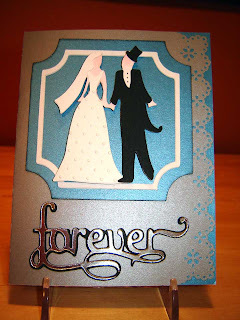 This is the wedding card I made for my daughter and her new hubby. If you're wondering how long this took to make... don't ask! It went on for days. I wanted everything about the card to reflect their wedding; the colours and elegance had to befit the occasion. 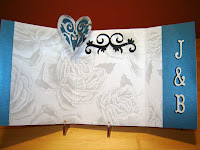 This was my first pop-up card so that involved a learning curve and a lot of patience, hence the time delay. But I think it was worth it. Don't you? Hmmm. Cartridges used are all listed at the bottom of this entry. 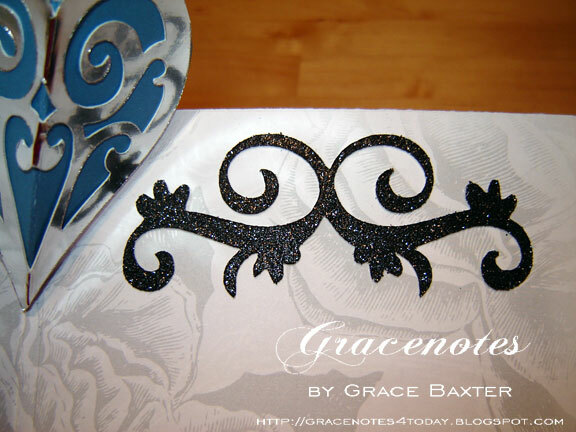 The card stock is luminescent in blue and silver. The blue/green just happened to match the bridesmaid's dresses. The word "Forever" is cut from silver mirrored stock and shadowed in black. For the front, I punched the right edge and adhered a strip of the blue behind it. 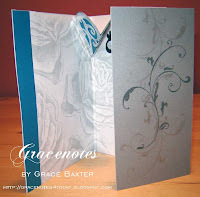 The right-hand panel is done in silver stock with black and silver swooshes stamped and layered. 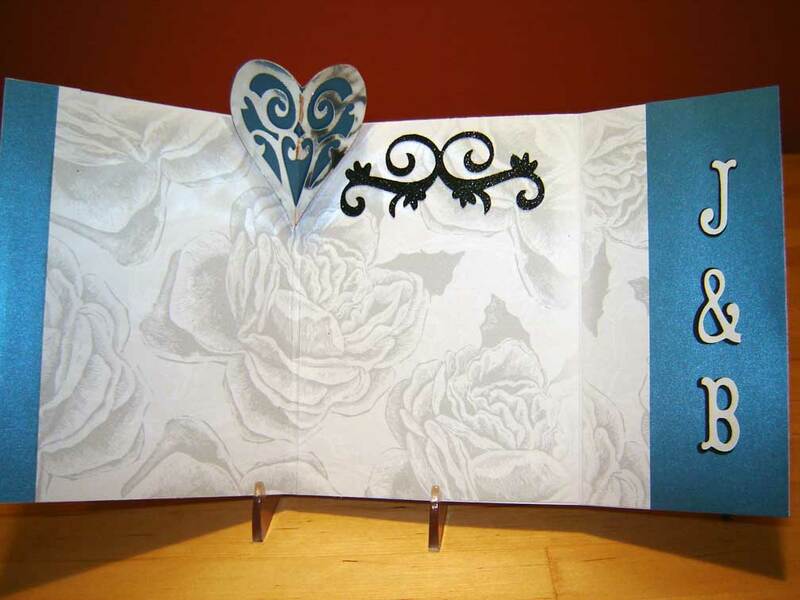 Inside, I used a wedding paper of soft silver roses on white. 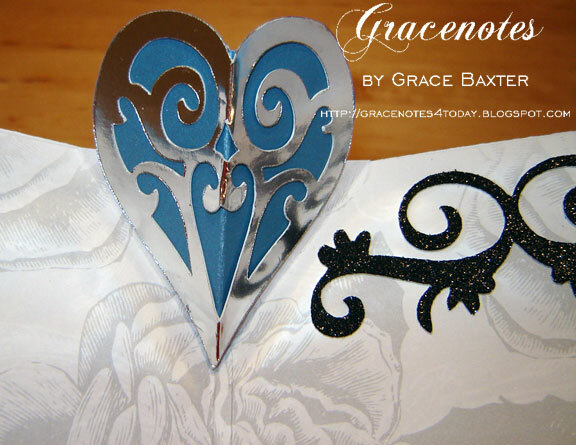 The pop-up heart was cut from blue with an overlay of shiny silver. 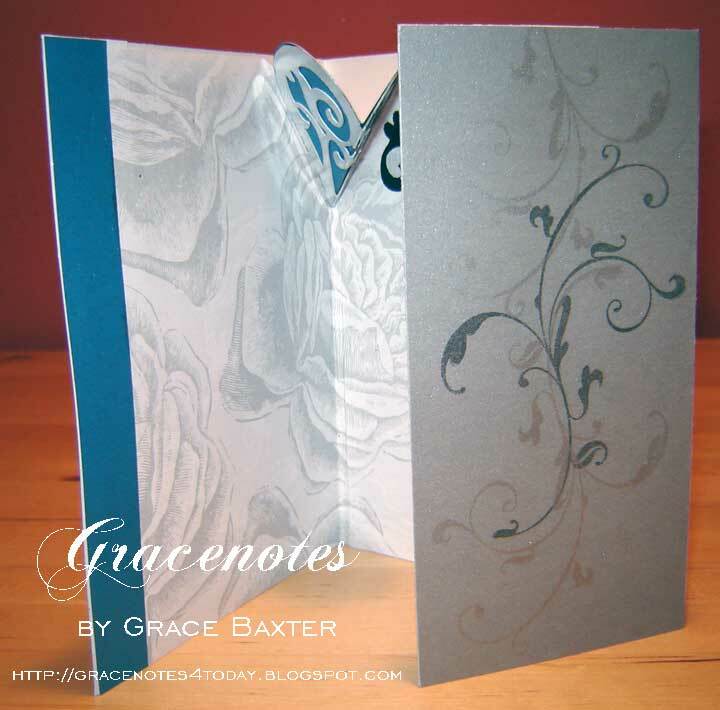 This tri-fold card provides lots of space for a verse or poem. I cut the Bride and Grooms' initials from white, shadowed in black. This picture shows the pop-up heart in detail. Flourish cut from sparkly black card stock. I just love this product and will be making a lot more embellishments with it. 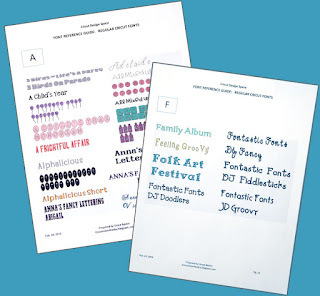 It will be wonderful for scrapbooking pages. It's quite stiff so I recommend lowering the cutting blade to 6 and set pressure to 5. Stunning card. I particularly love the choice of colours. I'm sure your daughter will treasure it forever. Congratulations to your daughter and her new hubby!